The start of the school year can also unfortunately herald the start of neck pain in teenagers. A recent study in the Netherlands found that nearly half of the 16 year old girls studied and 1/3 of the boys had had neck pain in the past few weeks. So why do so many of our teenage girls and boys get neck pain? There are a number of daily activities that are likely to contribute to tightness and pain in adolescent’s necks. We have all seen children walking bent forward with a heavy school bag on their back. Firstly, tighten the shoulder straps till the bag sits high on their back rather than down low which will drag the weight of it down and backwards. If the bag has one – fasten the waist strap around the child’s hips so that their pelvic takes some of the weight of the bag off the upper back and neck. Definitely discourage them from carrying the bag on one shoulder or using a shoulder bag. Next try and lighten the load – buy the lightest bag possible. Check that there isn’t forgotten clothing/ lunch/ umbrellas/ books at the bottom of the bag. Throw out that mouldy apple – every bit counts! A lot of school are using an I-pad now but the kids still seem to have text books too. If possible download the text book onto the i-pad or other device. Try and encourage your child to always check what books/ sports equipment/ clothes/ instruments etc they need for that particular day rather than just carting everything around all the time. Also, make sure the heaviest contents like text books are placed closest to the spine. This stops the backwards drag on the bag which encourages the slumped posture. Posture is paramount when it comes to using mobile devices and computers. Lap tops and mobile devices like i-pads are now common place among adolescents at school. They encourage slumped posture which puts the neck in a forward and extended position and means the posterior neck muscles have to work constantly to even hold up the head. Lap tops and mobile devices are worse for posture than computers because they sit lower on the desk and the screens are smaller. If possible encourage your child to use a desk top computer at home. If you don’t have a desk top computer invest in a stand and a separate keyboard for a laptop. Discourage using a laptop or mobile device in bed or lying on the floor. Make sure the home computer set up is adaptable to the size of different family members. The top of the computer screen should sit at eye height. The feet should be flat on the floor and the elbows should be at greater than 90degrees with the hands on the keyboard and the shoulders relaxed. Here at MGS Physio we have seen a pattern showing an increase in adolescents presenting with neck pain around exam time. The reason for this includes an increase in time in front of the books but also it seems to be related to stress. Stress increases the tension in the muscles around the neck. Other symptoms associated with this course of neck pain include clicking/ sore jaw, teeth grinding and headaches. Ensure your child takes regular breaks from study and keeps up the sports and other activities they enjoy. This is especially important in the highly stressful later years of school. Prevention is definitely the key but if you find your child has repeated episodes of neck pain have it investigated by a physiotherapist or your GP. Often what is needed is for them to hear the above advice from someone who isn’t their mum or dad! 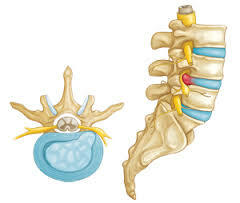 Slipped Disc – is it really? ?